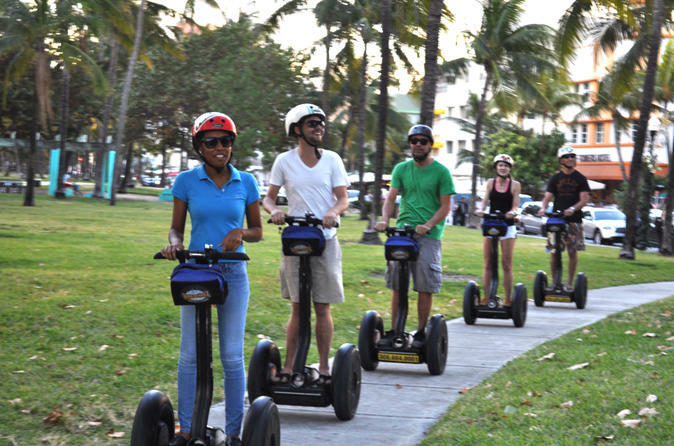 Art Deco Segway Tour Meet in South Beach at your selected departure time. Once you feel comfortable on your Segway, follow your guide through the glamorous South Beach area. This tropical paradise is home to the famous Art Deco District. Pass landmarks including the Versace Mansion and the vibrant Lincoln Road outdoor mall. Throughout your leisurely ride, your knowledgeable guide will teach you about the rich history, culture and architecture of this Miami area. Miami River Segway Tour Meet at Bayside Marketplace at your selected departure time. Once you feel comfortable on your Segway, your guide will lead you along the Miami Riverwalk, where the Miami River and Biscayne Bay merge in a watery paradise. Your guide will explain that this area is home to 2,000-year-old archaeological sites alongside luxurious high-rises, million-dollar yachts and titanic cruise ships. Please note: there is a maximum of eight (8) passengers per tour guide.